Whose Ἀντι Γονικη? Mine, Yours, Theirs? Where we tend to go wrong is in assuming that if there is to be a correspondence between two systems it must be a one for one correspondence–that A in the one system must be represented by a in the other, and so on. But the correspondence between emotion and sensation turns out not to be of that sort. And there never could be correspondence of that sort where the one system was really richer than the other. If the richer system is to be represented in the poorer at all, this can only be by giving each element in the poorer system more than one meaning. The transposition of the richer into the poorer must, so to speak, be algebraical, not arithmetical. If you are to translate from a language which has a large vocabulary into a language that has a small vocabulary, then you must be allowed to use several words in more than one sense. If you are to write a language with twenty-two vowel sounds in an alphabet with only five vowel characters then you must be allowed to give each of those five characters more than one value. If you are making a piano version of a piece originally scored for an orchestra, then the same piano notes which represent flutes in one passage must also represent violins in another. What do you hear when you hear somebody say Ἀντι Γονικη? You’re not exactly likely to hear Ἀντιγόονη. And it probably doesn’t even sound like “Antigone.” You might think more of the scientist Aristotle hearing something like that, or like this: ANTIGO NICK. And you might even think less of the playwright Sophocles if you didn’t know better. Our first questions are these. Are these titles the same? Are they all plays? Ἀντι Γονικη = ANTIGO NICK = Ἀντιγόνη = “Antigone”? this [version called ANTIGO NICK] can only exist as a book — this work cannot be properly performed. this very book is a rather like a performance (if a not so proper one). Once upon a time, Greek men used the little suffix “-ike” or “-ic” to make very technic-al all the things they didn’t understand. Hence from logos came log-ic, from oikos and nomos came econom-ics, from the muse came mus-ic, and this allowed men disparaging others to render the other mute. You can find Carson talking in an interview online about this work, but she will never give all of that away. How could she? You must read this book to hear it. Anne Carson, the translator, is playing with Greek sounds and Greek meanings and Greek words. ANTIGO NICK is how we “see” the word(s) in English on the page. There’s a plurality, a division of white space in this title. NICK looks, and sounds, a little like ΝΕΙΚΕΣ, as in Πολυ-Νείκης. And yet ANTI-GONICK looks, and sounds, a little like ἈΝΤΙ ΓΟΝΙΚΕ. Anti Gonike? Well, it seems a little strange to say, perhaps, but it sort of indicates ‘To stand in for the parents’. Maybe the way a foreigner would say ‘Adoptive parent’? That’s modern Greek, on the one hand. On the other hand, Ἀντιγόνη, is inventive, ancient Greek. But we don’t have to think about the playful name much these days, not in English anyway. The additional facts are these. The playwright likely has this titular character, this prot-agonist of his so named, to mean something like “Instead of her Mother.” It’s hard to be sure of his intention, exactly, since the letters of the Greek alphabet so strung together are somewhat ambiguous. They also seem to suggest an Agony, a struggle or a contest. Who we know as Polynices is the dead brother of Antigone, whom she strives to bury despite the order of the King, which would be against her and anti this dead body of this dead brother. As we all know by now, Poly Nices, means something like Many Strivings, the root of the phrase meaning strivings, Νείκης. Was this intentional by the playwright Sophocles? About all we can be sure of on this side of the translations into English is that this play has a main living character whose name is the title; and the titular phrase itself is a play, a theater of letters, a play on words, if you will. 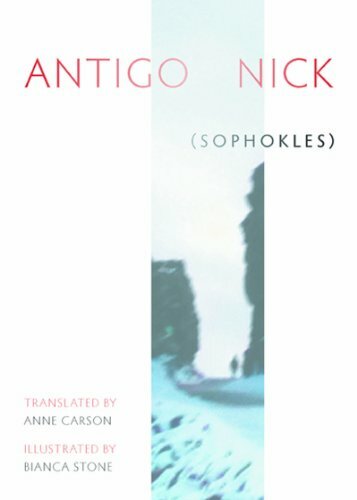 And so comes Anne Carson translating Sophocles’s Ἀντιγόνη, published in 2013. She enlists Bianca Stone. And she changes what Sophocles intended, or at least she changes his particular play on words, his theatre of the alphabet, that ancient inventive ambiguity of his; and she calls it ANTIGO NICK. Those who judge the resulting book of hers see its cover. An art panel (by Stone) divides the title in parts: Antigo Nick (and the playwright’s own right to be named as the very original author is relegated to parentheses). There is the hint that the English translation is playing with ancient Greek forms. The alphabetic letters are written by hand. and they are ALL UPPERCASE / SOME BLACK OTHERS RED. Why the transposition? Is this real translation? Is this really a play? We see poetry. We see word play. We see a performance of letters and sights and sounds. Probably they are not proper. How can actors bound to a strict interpretative script play with these? Carson knows ancient Greek better than any classicist or rhetorician or New Testament or Septuagint scholar that I know of. She plays on the English word, “nick.” Antigone, of course, is the titular protagonist of the play. And Nick, she notes in her list of the cast, is “a mute part [always onstage, he measures things]” (her brackets). I mention this detail, as if it’s not obvious to all readers, simply because when you understand the play as a commentary on the lack of agency of females when it comes to the law and to rhetoric, then you get a hint of what Carson the translator means by her title for the work. Are you going to put that chair back where it belongs or just leave it there looking like a uterus? Are you going to nick your throat open on those woodpecker scalps as you do every Sunday night or just sit quietly while Laetitia plays her clarinet for us? Maybe “on tea gun” is a better way to express the French pronunciation.